The world has looked to New York and Brooklyn for vision and leadership in human endeavor for over 200 years. The potential for a historic urban cemetery to diversify its role in the life of a city is being chartered by Green-Wood’s innovations. Cemetery proceeds are available only for lot maintenance. All other programming is funded entirely by grants and donations. From musical programs to monument-making workshops; tree-pruning classes to art installations, Green-Wood turns learning into enlightenment. Green-Wood’s historical holdings of artifacts and archives are a treasure trove for family researchers, genealogists, and New York historians alike. Across its core feature categories of art, history, and nature, Green-Wood sustains a deep and abiding commitment to preservation and restoration. Ambitious public programming and large-scale capital projects have raised the profile of Green-Wood as a premier cultural institution. Those with a passion for preserving our shared experience are taking notice. Event-goers enjoy A Night at Niblo’s Garden. Just as our staff cultivates the grounds of Green-Wood, our contributors help cultivate Green-Wood’s commitment to innovation; bringing a unique mix of art, history, and nature to the cultural life of the five boroughs and beyond. Green-Wood cultivators are a special lot. They care about the character of Brooklyn, they’re fascinated by the history of New York, and they love the hidden treasures of the city. They also know that their financial participation is what sustains the enchantment of Green-Wood, and keeps the diversity of our community experience alive. Green-Wood Historic Fund Members who support our mission. Help Cultivate Green-Wood - Click to donate! Green-Wood members and donors support art, history, nature, culture, and community all at once. That’s a big bang for a Brooklyn buck. “Sopladora Grande”, bronze cast sculpture by Javier Marin, blows a kiss. 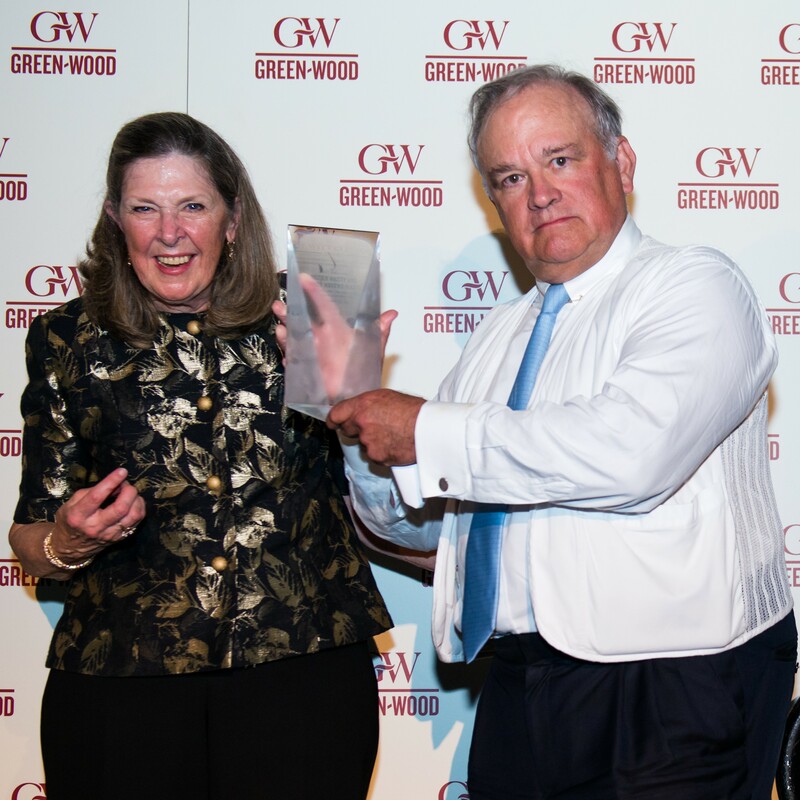 On September 17, 2017, the Tenth Annual DeWitt Clinton Award for Excellence went to Dozier Hasty, publisher of The Brooklyn Eagle, and Nancy Havens-Hasty, President of Havens Advisors LLC. The awardees share a particular passion for Green-Wood’s Annual Memorial Day Concert—which Nancy has twice conducted. The benefit evening began with cocktails under the Arch and a serenade of jazz by Sweet Megg and the Wayfarers. Remarks were made by Green-Wood President Richard Moylan, trustee Malcolm Mackay, Brooklyn Borough President Eric Adams and others. Two debut films highlighted Green-Wood’s commitment to art, nature, and history for generations to come. The evening ended with dancing and dessert under the moonlight at the Gothic Arch. There’s a membership tier for every budget and interest level, from the dabbling donor to the passionate patron. Each tier expands privileges, and all members get maps & guides, reduced or free event admission, plus genealogical research and retail discounts. Premium donor members can add private receptions with artists and historians, specially curated tours and talks, and more to their membership package.